First lady, and former model, Melania Trump chose a curious time to make a rather bold fashion statement — donning a jacket emblazoned with the message “I REALLY DON'T CARE, DO U?” to travel to a detention center housing migrant children separated from their families in Texas. The Daily Mail was the first outlet to report that the first lady was photographed leaving Andrews Air Force Base in Maryland on Thursday wearing the $39 Zara jacket. 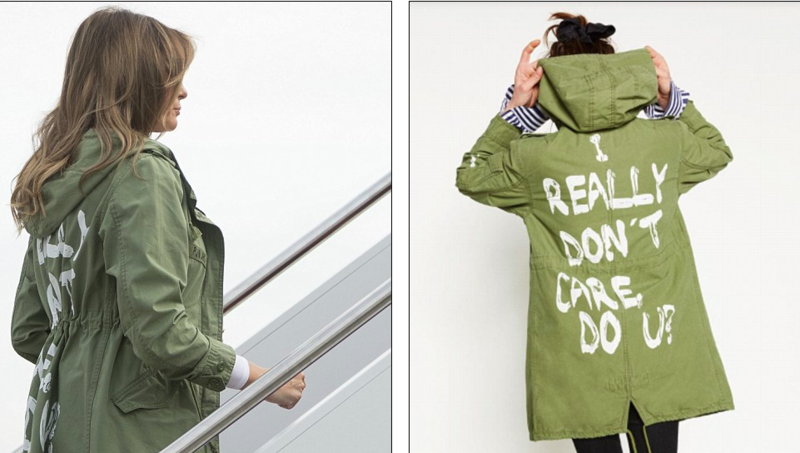 The green hooded spring military jacket with white graffiti-style lettering on the back almost immediately undercut the White House’s PR effort to suppress the outrage over the administration's so-called zero tolerance policy at the border. Trump, a mother and an immigrant herself, was sent to McAllen, Texas to humanize the officials who have made it official U.S. policy to seize children seeking asylum. By the time her plane landed in Texas, the first lady had taken off the jacket. According to the Associated Press, Trump wore a different pale yellow jacket for a visit to the Upbring New Hope Children's Center, which houses 55 migrant children, and made great effort to ask caring questions as cameras were allowed into a federal detention center for one of the first times. But by the time Trump left the detention center on Thursday, photos of her jacket had spread on social media. Her spokesperson Stephanie Grisham confirmed the first lady’s insensitive fashion choice but dismissed its message: "It's a jacket. There was no hidden message. After today's important visit to Texas, I hope this isn't what the media is going to choose to focus on." Coupled with top White House adviser Steve Miller and Department of Homeland Security Secretary Kristjen Nielsen both eating in Mexican restaurants and getting shouted at by protestors this week illustrates just how either completely tone-deaf everyone in the Trump administration must be, or how steadfastly committed they are to trolling — even in the face of caged children.